Whiteclay, Nebraska has a population of 12 people, yet each day four local shops manage to sell more than 13,000 cans of beer. So where’s it all going? According to a federal suit filed by the Oglala Sioux tribe, it’s being smuggled onto the Pine Ridge Reservation just over the border in South Dakota. The tribe alleges these brewers know their products are being smuggled onto the reservation, where alcohol is illegal and alcoholism rates are through the roof, and have done nothing to stem the flow of beer (or profits). 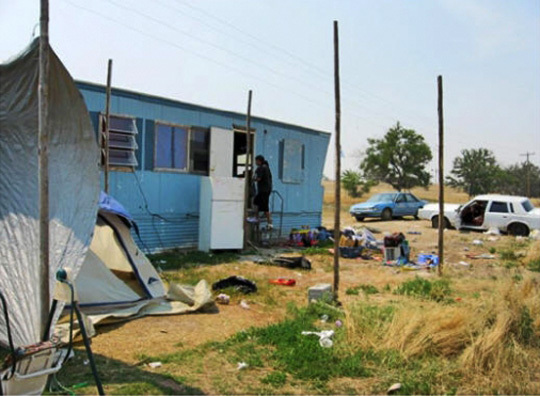 According to the lawsuit, 85% of the tribe’s population are “affected by alcoholism,” and the beer has had a “devastating effect” on the population of Pine Ridge, one of the nation’s largest reservations. The reservation is a pretty bleak place. More than half of its population of 40,000 live below the poverty line, and the unemployment rate is over 80 percent. Violent crime and suicide are major issues, and one in four children are born with an alcohol-related disability such as fetal alcohol syndrome. Shannon County, South Dakota is engulfed by the 2 million acre reservation, and is the third poorest county in America. The lawsuit filed by the Oglala wants the big brewers, the stores that sell the beer, and their distributors to pay the tribe for “all damages it has suffered in the past and in reasonably likely to suffer in the future.” I guess they think half a billion dollars will cover that. The filing of the lawsuit is the start of a drawn out legal process that won’t be settled for many years to come. In the meantime, hit the poll below and let us know what you think. Does the tribe bear responsibility for the enforcing of its own policies, or does the blame fall on those who aim to profit from the dysfunction on the Pine Ridge Reservation? You know funny thing is, if this tribe were to open a Casino, I’m pretty sure they would be selling as much light lagery crap as they could, or better yet giving it away to loosen up people’s purse strings and get more of their $$. Its hypocritical and I hope it costs them a ton for nothing! You don’t know that. So, you really can’t say that it’s hypocritical. That is why I was only “pretty sure” Zac. Fair enough, but you were more than pretty sure that it’s hypocritical. Wait, you mean they wouldn’t give the gambler’s their money back if they had a gaming addiction? So says the white man. Don, s’far as I know neither the Cherokee nor the Gypsies are noted for an inherent inability to handle booze–the Oglala are. Interestingly, there are apparently distinct genetic differences between the Cherokee and the Sioux. Seems like more and more these days, people have forgotten the notion of personal responsibility and they blame everyone else for their troubles when they first should take a look at themselves. Yeah, like taking responsibility for centuries-long profiting off the illegal imprisonment, slaughter, and exploitation of an entire population. Time for personal responsibility to raise its ugly head. Its also an observable fact that their are genetic elements involved in how or even whether one consumes alcohol. Some ethnic groups, such as western Europeans, have had centuries to adjust to consuming and metabolizing alcohol, as well as making cultural adjustments to control/mediate its consumption–and we still have major problems with it. However, the response of other ethnic groups to the effects of alcohol can and does vary from that of the Euros. For instance, many Asians exhibit the “Asian flush syndrome”, which is a response to not being able to metabolize alcohol (ALDH2 deficiency.) Apparently some tribes of Amerinds, have a a high incidence of alcoholism–variously attributed to genetics, environment, or a combination of the two. Genetic studies are underway to try to isolate genetic factors in these instances. So if a an InBev or Millers knows that a given group of people is prone to seriously overindulge and does nothing to limit exposure/availability of its product to those people, are they culpable? Legally, probably not, ethically, yes! But the same can be said for any product line in which the producer puts profit ahead of the welfare of its customers (witness Big Drugs and the shortage of some medications, or for-profit hospitals.) This is the tip of a very big iceberg. In the pursuit of the bottom-line have we taken capitalism where it should never have gone? There are many who think so. Just another frivolous lawsuit. People need to be responsible for their own actions or their families actions . Where was there family while these people were falling down drunk? I think the article said smuggled. Writing a law won’t stop it just like making drugs illegal in the USA does nothing to stem the flow. Outlaw it and the flow will probably increase. Not enought info. Do they have hard evidence (other than sales volume) of collusion with intent to distribute into the reservation? Have production and sales quotas been amped up with that as the goal? I believe in personal responsibility but (and remember, corporations are now considered people !! ), I believe perhaps the bar should be a bit higher than completely ignoring the situation as if it didn’t exist. It makes it really easy for all of us who have benefited in some way from the exploitation of Native Americans to simply pull the “personal responsibility” card. I mean, if they would just take responsibility for their own actions, they would have never been on those reservations in the first place, right? If I blame the dire situation of Native Americans on their own inability to take personal responsibility for their actions, then it absolves me from any guilt. Maybe the suit is a bit frivolous or at least hard to prove, what other choice do they have? We (meaning Americans of European descent) have take so much from these people. No matter how much you tell yourself that it has nothing to do with you, it does. You have benefited from the exploitation of human beings in some shape or form and no one has benefited more than corporations like Anheuser-Busch Inbev, SAB Miller, Molson Coors, and Pabst. Now, can we get back to something more light-hearted? I come here to forget how terrible the world is. See previous Star Trek comment. Do you cry yourself to sleep every night? No…then why would you care all of a sudden now? Nobody In our generation have enslaved anyone in our day, and to say I should feel guilty about something my ancestors did more then over a hundred years ago is simply a stretch. You realize that some Indian tribes profit immensly from the land they have and the lack of “laws” they have to live under. Yes it’s sad that this tribe is doing this to themselves and can’t seem to govern themselves, BUT you know what’s not sad…the fact that the seminole indians bought Hard rock cafe for 965 Million$. Yes 965 million that is severely under taxed in comparison to a corporation that is not located on a reservation. You left that out when you were talking bout how bad we’ve been to the indians…You are very quick to say that when we/I say this is an absolutely frivilous lawsuit that were just covering our guilt but I think it’s simple logic. So if there was a way for “big beer” to limit what they sold to these Native Americans, how long until someone cried racism for not selling them alcohol because of the color of their skin? There is no good answer here and people are going to find a reason to sue someone no matter what. Yes it is terrible what happened to their people hundreds of years ago but it is time to get over it. Horrible things have happened to Blacks, Jews, Irish, the list goes on and on. At some point people need to stop making excuses and take care of themselves. There is still plenty of opportunity in this country for anyone who is willing to put in the work and effort. Time for people like these Oglala to stop being victims and time for people like Zac to quit feeling guilty for being a white boy in America. We are all equals in this country now and people need to act like it. You are? Except that you think big brother needs to step in and save these folks, that they can’t take care of themselves… I think if they put their minds to it they could grab those bootstraps and pull… When did so many people in this world become such candy asses? We may aspire to the ideal that all men are created equal–but we’re still far from that ideal. Consider, the rich man (or corp) who steals billions and is fined millions; consider the work-a-day investor trying to build up her retirement portfolio who has to compete w/ a pol who has inside information that will affect the market & destroy dreams; consider the gay man who lives in a monogamous relationship for 30 or more years but when his partner gets cancer is not accorded the hospital visiting privileges of family, and when that same partner dies is not automatically accorded the inheritance rights of a spouse; consider a Marine stationed in Iraq who asks a valid question at a conservative gathering and is booed because he is gay; consider the likelihood that a deaf person or a blind person or an American Muslim could become president (or even run.) Equal? Not yet–that’s why we need to keep addressing these issues. As for open-ended government give-aways and subsidies, I’m against them–for either individuals or corporations. But I am for the ethical treatment of all citizens, by the citizenry as well as the government. I am for responsibility in government and business. I am for a business ethic that sees further than the next quarterly dividend, and executive boards that make decisions with the the customer in mind. I am for a representative government that isn’t the best that money can buy. I am for a helping hand to those who are willing to use it to better themselves. Finally, I am for empathy. Walk a mile in the other man’s shoes–its a tad uncomfortable but very edifying. IF it’s found that distributors/brewers are breaking interstate commerce laws, then yes sue the balls off them. Otherwise, I see no reason why Big Beer has to take the blame for a community’s alcoholism. Besides, they don’t take responsibility for drunk driving accidents, low test scores in high schools and colleges, unemployment, domestic abuse, and other pro-temperance buzz words when it happens in non-Indian communities, so why give a load of money to a people who break their own laws to get hammered? We’re talking rampant addiction here. Whether its a result of nurture or nature, its happening right here in the middle of the U.S. of A.–our country! Its a situation that needs to be considered in a calm sober manner, not ignored. Leave the boot-strapping for those who own boots! I grew up on a reservation in South Dakota and I am part Native American. My grandpa was a functioning alcoholic, and I’d wager that my father is, or is damn close to it. I know poverty, I know addiction, I know the tribe and the people. And I’m very confident in saying that the tribe needs to do something for its people other than sue Big Beer. The tribe enables its people by making sure they have cash to purchase beer, cars to drive to get beer, lack of peer addiction treatment programs on the res and support groups that communicate openly and frequently about addiction and the dangers of alcoholism. The tribe ultimately supports each person, addict or not, as equals, and the consequences are blunted and lessened for members of the tribe. (I could go on and on about this point, email me if you want to fight it out because here is not the place!) Just like unwavering support and continued mollycoddling results in an unrealistic, spoiled, unprepared-for-the-real-world trust fund jack@ss, the tribe does the same to its people. They need to own up to what their people REALLY need, and while suing Big Beer to quit distributing in one place may decrease beer consumption temporarily, it doesn’t at all address the permanent problem. Let’s have a beer and talk about it….